What is a Real Estate Land Trust used for? Randy Answers that question in this video below! Welcome to the most comprehensive Real Estate Trust website in the World. My name is Randy Hughes, Mr. Land Trust, and I want to teach you all the benefits of using a Land Trust to hold title to your real estate investments. I am not talking about non-profit land conservency Land Trusts, but Trusts that hold title to your investment property (houses, apartment buildings, raw land, etc.). Yes, I also use Limited Liability Companies (LLC's) and Corporations, but NOT to hold title to investment real estate. Unlike LLC's and Corporations, Land Trusts are not registered anywhere on the planet! Therefore, learning how to link the Land Trust together WITH an LLC or Corporation gives you ultimate privacy AND asset protection. All three of these questions are very important to your long term financial health. Let me be straight forward with this information. You are working very hard to accumulate property for investment and cash flow. You put yourself, your family, and your children’s financial future at risk investing in real estate. Trusts are the first line of defense to insulate yourself (and your family) from the millions of lawsuits happening every year. Do you want protection from your number one adversary...the contingency fee lawyer (and his deadbeat client) or would you rather have a bare knuckle fight with him without any defenses in place? For citzens of Canada and Mexico that are buying property in the USA, please note that it is perfectly legal for you to hold title to your investments in America via a Land Trust. Please call me for additional details at 1-866-696-7347. Land Trusts are THE #1 LEGAL way to get your name out of the County Court House record books. Start creating your own trusts today and understand the process. You DO NOT need to be an attorney to form your own trusts. You dont have to be an attorney... Again, you do not have to be an attorney!!! My system was recently viewed by an attorney from So Cal to see if he can penetrate my system. Watch what he says below. After being in this business for over 46 years I should know a thing or two. You want to put each property into its own SEPARATE real estate trust. You may then have your LLC or Corporation serve as the beneficiary of your Land Trust....and I will discuss that technique later. There are numerous types of “trusts” that have been used in our country over the last 200 years. In fact, Land Trusts and the law behind them followed the settlers over from England. Almost 500 years ago in medieval England, property trusts were used by the common man, “serfs”, to protect their property rights from those who were in power at the time. Trusts served not only to protect assets, but also to avoid taxes and laws of descent. Even though King Henry VIII tried to bypass the use of trusts (to prevent serfs from holding title to property in “trust” and avoiding the responsibilities of land ownership), the medieval courts of England (and most courts since) have upheld the use of land trust and the rights of their beneficiaries. Since most American law escheats from English Common Law, the use of trusts and the law supporting them was easily blended into American law. This was around 1795. About 100 years later, a land development company in Illinois wanted to subdivide a large piece of ground that was encumbered by a large mortgage. Since the mortgagee would not release the lots individually until the entire debt was paid off, Chicago Title became involved with the developer. Chicago Title became the trustee of the entire parcel and guaranteed would-be buyers/beneficiaries and prospective mortgage companies that free and clear title would be eventually delivered once enough lots were sold off to pay the mortgage off in its entirety. This worked marvelously. Enough about history! How do these Trusts help YOU? I have done the research and are continuing to do so on a daily basis. This next part shows you something others will not. THE STEPS OF CREATING A FUNCTIONING LAND TRUST. I am not asking you to first buy my product to see this, I want to show you how easy it is to do this on your own. You can and will create your own trusts IN AS LITTLE AS 5 MINUTES (once you have the proper knowledge and forms). The key here is EDUCATION. You can buy the forms anywhere but, will you know how to use them to your advantage? I have been forming land trusts for over 40 years. I teach you the creative strategies that give these trusts "teeth." Would you want to use a brain surgeon who has all the medical tools but no EDUCATION on how to use those tools? I think not. "How we think and how we behave determine where we are going." Land Trusts Made Simple - Buy Now! Print out the Basic Land Trust Agreement (5.0) version from your forms CD, Download or directly from the Land Trust University. Throughout this writing I will refer to the Land Trust Agreement as “TA” for purposes of brevity. Now, you have a hard copy that you can fill in and make notes on. Once you are done with the construction of your first (hard copy) T.A., you can go back to your computer and finalize an electronic version. Decide which of the three preambles fits your situation and follow the instructions given before deleting the two preambles you will not use. Once you select the preamble that fits your needs you will also insert the name of your trust and the name of your Trustee. Naming your Land Trust: Starting on page 58 of my Land Trusts Made Simple Basic home study course guide I discuss the importance of choosing the “right” name for your trust. You may name your trust virtually anything you want if the name is not infringing on copy write laws. For example, you should not name your Land Trust, “General Motors” or “General Electric.” You could, however, name your trust the “GM Motor Trust” or the “GE Investment Fund.” Naming your trust is just one little piece of a big legal puzzle that you are creating to hide and protect your assets. It may seem insignificant to some but, if you have ever experienced the prospects of a frivolous lawsuit and avoided the suit because of the name of your trust or the situs of your trust…you become a believer! Naming your Trustee: keep in mind that it is best if you have a Trustee from the same state as the situs of your Trust Agreement. (i.e. Virginia Trustee for a Virginia Land Trust or a Florida Trustee for a Florida Land Trust). You might legitimately change the Trustee to an individual in another state after at least one year. Also, remember the best (most private) Trustee is one who lives out of your state (or at least out of the county where the property is located) and has a different last name than yourself. Revocable vs. Irrevocable? Paragraph 1.1 of my Basic Land Trust Agreement requires a statement of the type of Land Trust that you are forming. You need to decide if the trust will be Revocable or Irrevocable. Revocable means that you can make changes to the terms of the trust agreement (by amending the trust agreement). Irrevocable means that you cannot change the terms of the Trust Agreement. The trust must remain intact (as you formed it) until the expiration of the trust term (usually 20 years, but not mandatory…could be less). While Irrevocable trusts have more asset protection than Revocable trusts, they may require Federal tax ID numbers AND have to file separate tax returns (and are taxed at a much higher rate than individual tax rates). Your next decision is to decide who will be the Beneficiary of the Land Trust? Be careful here because if you are currently the owner of the property being placed in to the new Land Trust and you make someone other than you or your spouse the beneficiary, there could be a gift tax problem created by this action. As discussed in the Land Trusts Made Simple course guide (if you are placing investment property into Trust), you may want to consider making your personal property trust, LLC or corporation the beneficiary for future asset protection benefits. NOTE: Some advisors encourage multiple beneficiaries or co-beneficiaries. I have included a sample Beneficiary Agreement (in your course materials) to use if you decide to have more than one beneficiary to your Land Trust. However, I do not suggest multiple beneficiaries because of the potential liability between co-beneficiaries (unless you use each other’s entities as co-beneficiaries). Depending on whether you will have a Single Beneficiary or Multiple Beneficiaries, follow the instructions (Just prior to 2.4 (b)) carefully and delete the paragraph (Option 1 or 2) you will not be using (keeping the one appropriate for your situation). Decide who will be the Successor Beneficiaries. One of the many benefits of using a Land Trust is the fact that upon the death of the Primary Beneficiary the Successor Beneficiary succeeds to full Beneficiary status immediately upon the death of the Primary Beneficiary (outside of the purview of the public through probate process). If you are forming a Revocable Land Trust, you may change the successor beneficiary(ies) later if you so desire. However, I still suggest you to think through this decision wisely prior to naming your successors as life has a way of changing our attitudes quickly. Your next big decision is who will hold the Power of Direction? As you learned in the Land Trusts Made Simple course guide, he who holds the power of direction (over the Trustee) controls the trust’s destiny. So, choose this position wisely! Typically, the Beneficiary is also the Director (at least initially at the formation of the Trust Agreement). In paragraph 3.5 you will decide if you want a Successor Director or not. Remember, you can always Amend your TA if you change your mind about any of these “players” later. Decide who will be your Successor Trustee(s). You may want to review the section on who can be and should be your Trustee in my Land Trusts Made Simple Basic Course Guide. Like step 6 above, now you select your Successor Trustees in your Trust Agreement. Successor Trustees will provide for a smooth transition of title if your Primary Trustee (the initial Trustee that you select) dies, retires, quits, or is fired by the Beneficiary. You can name as many Successor Trustees as you want. I suggest using a P.O. Box for your Successor Trustee’s address. NOTE: Successor Trustees do NOT have to be notified of their status until they would ascend to the position of Primary Trustee. You may not have a choice in how much you pay your Trustee if you use an institutional trustee. Typically, a “professional” trustee will charge 300-500 dollars to set up the trust, 300-600 dollars per year to maintain the trust, 50-75 dollars for each signature the trustee provides and 50-75 dollars to perform administrative functions (like forwarding a real estate tax bill to the beneficiary). One of the reasons why I suggest private trustees is to save on these costs. You can pay your trustee whatever you two agree on but make sure it is reasonable and customary for your area. If you use an individual as your Trustee and have an agreed upon amount of annual compensation, state the amount here in 7.1 (b). If you are using an institutional Trustee, he/she/it will write in their amount of compensation in 7.1 (b) when you set up your TA with the professional Trustee. This paragraph states how long you want the Trust Agreement to last. As stated previously, most Land Trusts are created for a 20-year period. However, this is not a statute requirement and therefore you may want to consider some other term for the existence of your trust. I have given you some suggestions in 9.2. Be sure to delete my suggestions and instructions after making your decision and stating the term of your TA. Your next decision is going to be which state’s Land Trust laws are you going to use as the situs of your trust? If you decide to use Virginia for example, you would put the Virginia statute citation (You will find each state’s trust Statute cited in the “50 State’s Trust Laws” section of the Land Trust University). Which state law will govern your trust is extremely important to the asset protection benefits you are seeking. So, do your research and choose wisely! Type in the party’s names (under the signature lines) that will sign the TA (whether they are individuals or representing an entity). While it is not mandatory that the TA be notarized, I suggest that you do this because it adds validity to the date in which you formed the trust. At this point you have made all the big decisions to form your first Land Trust Agreement. All you need to do now is date your Trust Agreement (be sure it is dated prior to the date on the Deed in Trust) and get the signatures of the Trustee, Beneficiary and Notary. DO NOT record the Trust Agreement----only the Deed-in-Trust gets recorded! The Trust Agreement stays in your personal files as a private contract document. Your final act in completing your first TA is to list the property being held by this Trust. Be sure to include not only the Legal Description but the Common Street Address of the property you are placing into this trust. However, this will not be your final step. Please proceed to the Bonus Step #14 below. Step 14 is extremely important so, please do not by-pass this step. This is the point where many investors drop-the-ball in the important process of forming their land trusts. Insuring your property properly is a very important part of being a successful real estate investor. If you make changes in the ownership of a property it is critical that you follow a certain process to communicate those changes to your insurance company and insurance agent. Step Twelve is written to give the sequence of steps necessary to report changes, acknowledge changes being completed, monitor the necessary coverage and keep all information accurate between you and the insurance company. Make sure that you insure your property “held in trust” properly. This is CRITICAL to receiving insurance coverage (payment of a claim) if there is a loss/claim. I highly recommend that you sit with your insurance broker, agent or advisor before you buy any property, make a change in ownership or deed your property into a land trust. TJ is a college student that was looking for a better answer when taking title to real estate. He found my site, called me and then purchased the Land Trusts Made Simple Basic Homestudy course. He was able to create his own Real Estate Land Trust without an attorney or Realtors. TJ W.
See how Easy it is to Create a REAL ESTATE LAND TRUST? Remember how I talked about my competitors and how they give you the FILL IN approach with no training? GOOD, because if you bought their product, you would have received some of the above information. BUT WOULD YOU UNDERSTAND A LAND TRUST NOW? NO! You would then start looking for an attorney to help you form your trust and s(he) would CHARGE YOU hundreds of dollars each time you needed assistance (assuming you can even find a knowledgeable land trust attorney). I will make this Simple. In fact, I call my courses “Land Trusts Made Simple” which is important when covering an ESSENTIAL component of real estate investing very few talk about. My courses not only cover the steps as I have given you above, but I explain the LOGIC behind each part of the process. THIS WILL GIVE YOU PEACE OF MIND THAT YOUR TRUSTS ARE SET UP PROPERLY FOR YOUR OWN INDIVIDUAL SITUATION. I have broken my system into two courses. You will start with the Basic Course to create your own trusts. This is all you need if you want to just learn how to create a Land Trust (and get all the forms you will ever need). My Advanced Course is a MUST if you want to take your trusts to a new (bullet proof) level. This advanced course will add a deeper understanding of trusts and complex privacy structures. You can get both my Basic and Advanced Courses together in my "Complete Package" at a discounted price. Ready to get started? 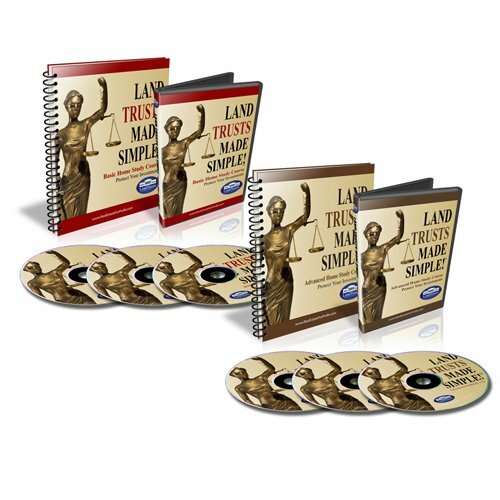 Here is my most popular Land Trusts Made Simple Home Study Course purchased by thousands of investors since 2002. Here are some comments from one of my satisfied students. "Today I received the mailing of course materials ordered. I'm very pleased to say that your package containing the CD's & DVDs looks very professional for a first impression. I'm very pleased up to this point. I just popped in the first DVD and have only watched about ten minutes. There is something about listening to a presentation that makes a course come full circle. I'm not only impressed with the physical look of the package, but additionally the few words heard in just these few minutes of viewing was a indication that more valuable information is to follow as I watch the entire course. Don't get me wrong, I'm not saying that reading and looking at the written course material is not adequate, but just seeing one give the course is an added bonus when taking in all the information."